BANGKOK, Thailand – Catholic and Protestant leaders said they have urged Christians to stay neutral and pray for peace in the country, which remains deeply divided in a protracted political crisis. Father Anucha Chaiyadej, managing editor of the Bangkok Archdiocese’s weekly newspaper, Udomsarn, said Catholics must strictly abide by Jesus’ teachings during the crisis and avoid siding with any political group that uses violence. He spoke to the Asian church news agency UCA News. The priest said Cardinal Michael Kitbunchu of Bangkok has emphasized that in the current situation Catholics should avoid taking sides. He added that archdiocesan policy forbids priests from making any arrangements with any political party during the crisis. Father Joseph Trebaol, superior of the Paris Foreign Mission Society in Thailand, said he also has advised his members not to take sides. “I have lived in Thailand for 36 years and seen many political upheavals and violence … but the political crisis this time is very critical. I still do not see a solution in the near future. What we can do now is pray and encourage our people to live in the peaceful way,” he said. Less than 1 percent of Thailand’s population of 65 million is Christian. The Rev. Manoch Jaengmook, president of the Evangelical Fellowship of Thailand, said his church has circulated letters to members across the country to pray that all rival groups live in harmony. Last year, three successive governments were unable to function properly because of mass street demonstrations, sometimes accompanied by violence. Protests by the People’s Alliance for Democracy played a key role in toppling two elected governments during the year, accusing them of being the puppets of Thaksin Shinawatra, the prime minister who was ousted in a nonviolent coup in 2006. Supporters of the People’s Alliance, wearing yellow shirts to symbolize their support for the monarchy, blocked streets, occupied a government building and, in November, shut down Bangkok’s two airports for more than a week. 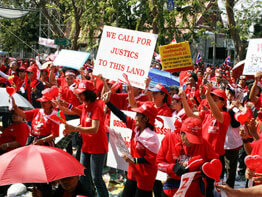 Since mid-December, demonstrators wearing red shirts under the banner of the pro-Thaksin Democratic Alliance Against Dictatorship have been holding street demonstrations against the current government of Prime Minister Abhisit Vejjajiva. The Democratic Alliance supporters have blocked and damaged Cabinet ministers’ vehicles and chased them when they appeared in public.